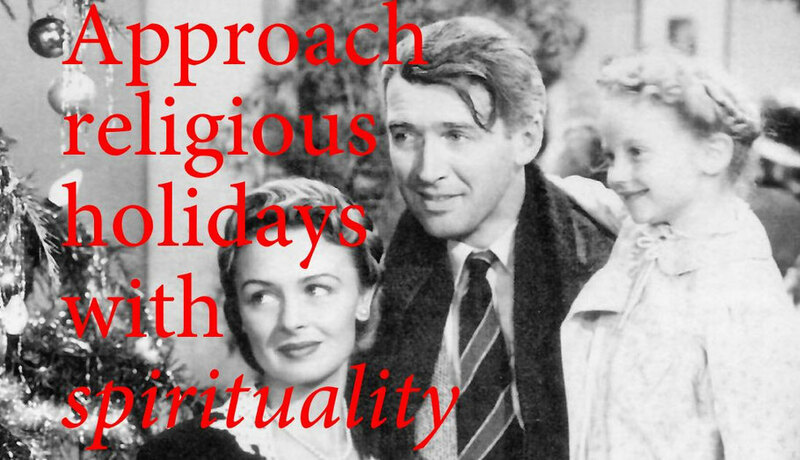 At Christmas time, is there a room at the inn for spirituality? Gift-giving seems to have evolved as the most prominent feature of Christmas. The rites of the church remain relevant only inasmuch as sanctuaries fill up with the C & E crowd (people who attend only at Christmas and Easter). Thanksgiving Day concludes by early evening after having stuffed both the turkey and our bodies, and in anticipation of Black Friday. And as shoppers rise at an ever more ungodly hour to revel in retail madness, they are reminded it is “time to get into the Christmas spirit.” Left unspoken is that the Christmas spirit ends early Christmas morning as the last bit of gift wrap has been decimated. As Christmas Day wends its way through the family-gathering staples of feasting, gossip and sports; there will be a relative few expressions of genuine and sincere appreciation for gifts of particular sensitivity and appropriateness. More likely is grousing about stinginess or under-appreciation related to wish list items that failed to materialize. The most predictable outcome for the majority of gifts is that they are summarily placed aside, stored, or otherwise forgotten. And the most disappointing outcome occurs when gifts are not accepted as a special conveyance, an act of generosity and love as practiced by the three kings when they met the Christ child; but, rather, as a contractual obligation, an act of compliance with the recipient’s demands (i.e., wish list). So, how does one return to a truer spirit of Christmas? Ditch the wish list – Santa Claus is not a magical genie. As children write to Santa, help them differentiate between requests and demands. As they come to understand the true personality of Santa, help them distinguish that love is not to be measured by dollar signs, but by the thoughtfulness incurred in making meaningful selections. Give ‘meaning’ – It used to be that special acquisitions in the form of gifts were reserved for significant holidays such as birthdays, anniversaries and Christmas. The phenomenon of easy credit has turned delayed gratification into a quaint, old-fashioned notion. Because we can purchase what we want anytime we want, the occasion of gift-giving has lost its mystique. The ‘success’ of Christmas is now too often determined by the number, volume or cost of the gifts received. To give ‘meaning’ goes beyond mere delayed gratification (simply waiting for Christmas Day to receive an already agreed-upon gift). It is more meaningful to locate special gifts that will surprise and delight the recipients. Express love – There is no greater gift than to teach children values. There is no greater value than to love oneself. That means providing an example of thrift and economy as opposed to avarice and greed. When you love yourself, there is less need for possessions and status. Teach – Christmas is not just about the birth of Christ, it is about the values he espoused that form the foundation of Christianity. If greed, avarice and covetness overcome charity, grace and compassion (at any time of the year), the spirit of Christmas is lost. If children are to know the difference, they must be specifically taught to discriminate between that spirit and the messages they receive continuously via mass media.